The Epcot International Festival of the Arts is in full swing, so it got me thinking about the Walt Disney Company and all the talents artists that like to show their affinity for Mickey Mouse and company. What constitutes art is in the eye of the beholder. You may treasure that priceless Monet masterpiece handed down through your family for generations or you may have a collection of keychains that you love and look beautiful on hooks around your house. For Disney lovers, the same holds true. There's original artwork that runs for thousands of dollars and also that magnet currently on your refrigerator that reminds you of that special trip and always makes you smile. There are many kinds of Disney art. I wrote an article a couple of years ago about The Art of Disney and the different artwork available. I don't want to bore you and repeat myself, so if you're interested in different types of Disney artwork available and what terms like "limited edition," "production cel," and "giclee" mean, I encourage you to check it out. Once upon a time, you could buy a piece of artwork that was actually used in the production of an animated film at one of the theme parks. If you got in on the ground floor, you could get these pieces of history for only $1! The price then went up over the years—a lot—and as we moved into the 1990s and 2000s, the time period when hand-drawn animation gave way to computer-generated production artwork for sale by Disney became scarce, and then nonexistent. Fans wanted Disney art, and the company had to get creative in how to satisfy this need, to help fill that merchandise void. The solution was turn to a new generation of artists that shared a love for Disney, its characters, and its films. Talented artists whose primary job is to create artwork for Disney merchandising. Artists employed elsewhere in the company who just love producing these images. And finally, artists outside of Disney who want to share their own spin on the Disney universe with the world. 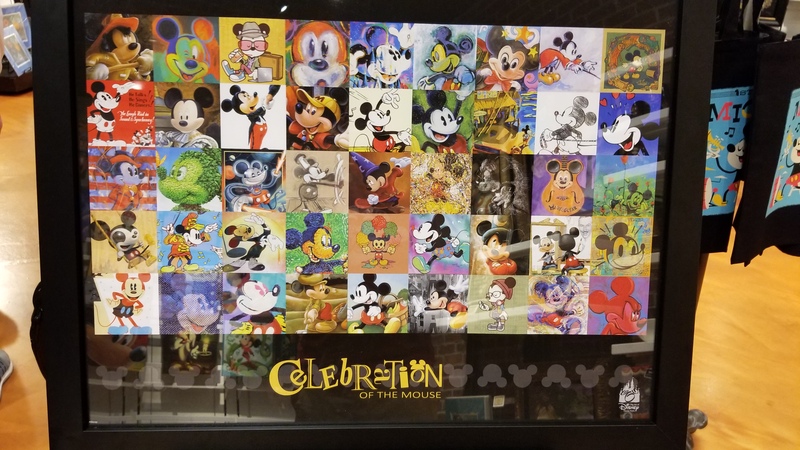 To help honor the 90th birthday of Mickey Mouse, Disney has released the art series, "Celebration of the Mouse." 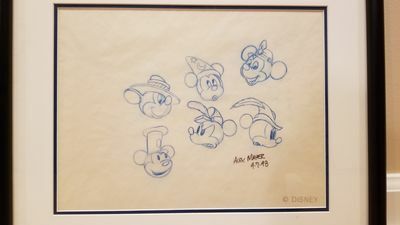 Disney let many of its favorite artists loose to depict the big cheese in a wide variety of ways, allowing them to put their own spin and style on Mickey Mouse. The images in this series include the classic and avante garde, colorful and black-and-white, and new and old. The Celebration of the Mouse series provides a wide range of Mickey Mouse images to help celebrate his 90th. Photo by Gregg Jacobs. Let's examine this series for examples of the styles and talent of some of these great artists. The first artist is Alex Maher, who's always been a personal favorite. His works of Disney characters, depicted either alone or in familiar Disney film or theme park settings, have always been fan favorites. I was actually fortunate enough to meet Alex at a Disney fan event many years ago, and he was gracious with fans, talking about how he's always been a Disney fan and loves spending his days with Disney characters. 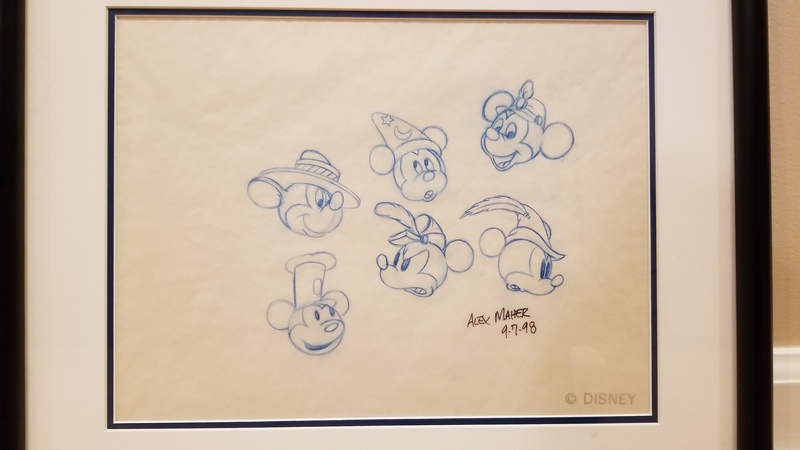 A signed, original model sheet from Alex Maher of many Mickeys many years ago. Photo by Gregg Jacobs. 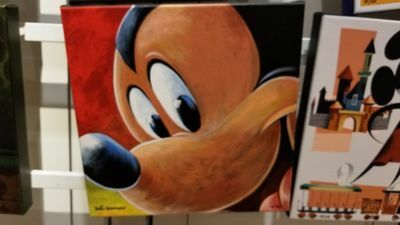 "With encouragement from his parents and his wife, he moved his family to Orlando in the summer of 1991 to pursue his dream of becoming a Disney artist. Mr. Maher began as a contract artist for Disney. He finally his achieved his lifelong dream by being hired full time as a senior character artist with Walt Disney Attractions Merchandise on December 6, 1993. "As a senior character artist, Alex's responsibilities include drawing all the Disney characters, to train the younger character artists and make sure the integrity of the Disney characters are upheld". His entry in the Celebration of the Mouse reflects his love of Disney history and Disney animation. 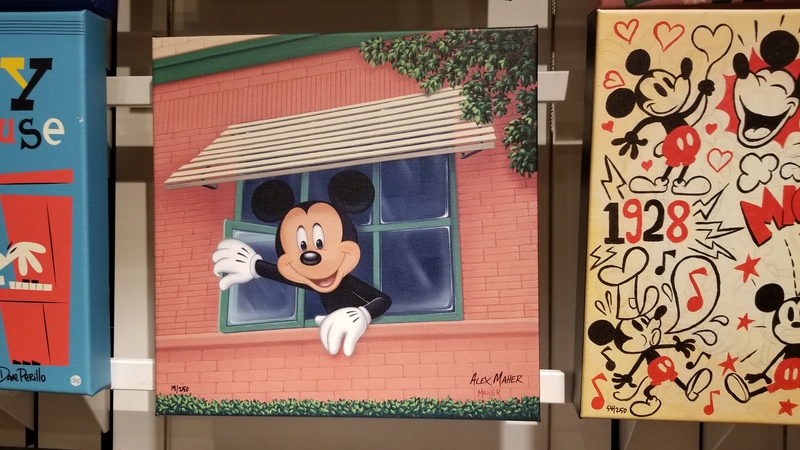 The piece, entitled "Hanging Out in D-Wing," shows Mickey sticking his head out of those classic shutters from the Disney Animation building that we've all seen. D-Wing is the section of the studio that housed Walt Disney's Nine Old Men—the Disney legends who pioneered Disney animation that Alex Maher and the rest of us revere: Les Clark, Marc Davis (love his tombstone outside the Haunted Mansion), Ollie Johnston, Milt Kahl, Ward Kimbell, Eric Larson, John Lounsbery, Wolfgang Reitherman, and Frank Thomas. Alex Maher reflects his love of Disney Animation with his Celebration of the Mouse entry. Photo by Gregg Jacobs. Another veteran Disney artist, Brian Blackmore creates artwork that's fun. "For the past 20 years, he has lived his dream by creating many of the merchandise items that can be seen at Walt Disney World, Disneyland, Disney Cruise Line, Tokyo Disneyland, and many other areas of the Disney organization". He also has the claim to fame of having designed the Mickey Mouse that adorns the bow of the Disney Dream cruise ship and the Mickey design on the Disney's Magical Express bus (which transports resort guests between Orlando International Airport and Walt Disney World). Brian Blackmore's creation is Celebration of the Mouse is Colorful Mickey. Photo by Gregg Jacobs. For my own experience, I feel the Brian's work reflects his vast experience with the company. He's done both classic and contemporary artwork featuring many aspects of the Disney universe. Matt Hawkins is an example of a talented artist from outside the Walt Disney Company that creates Disney artwork. According to his bio, Matt is "a papertoy artist, illustrator, cartoonist and incessant doodler living in Kansas City." He's a specialist in paper toys and sculpture, and has actually written a book on the topic, Urban Paper. Matt Hawkins background as a paper toy artist and cartoonist comes through in his cartooney Celebration of the Mouse image. Photo by Gregg Jacobs. While it may not be initially obvious, Matt's eccletic background actually makes him a natural fit for Disney artwork, and he's produced many pieces for the company, including some in his medium of paper. He provides a great example of an "outsider" putting his own spin on classic Disney characters. Bill Robinson is another example of a newer artist exploding on to the Disney scene. According to his bio, Bill "likes wandering the Disneyland park in search of undiscovered secrets and can often be found doodling people in line for the Haunted Mansion." He's done a wide range of artwork for the company and has also illustrated a number of children's books, such as the Anna and Elsa chapter books for Random House/Disney. In this piece, Bill Robinson depicts Mickey Mouse as "Jack in the Beanstalk." Photo by Gregg Jacobs. Robinson's love for Disney is evident in his pieces featuring stylized images of characters from Disney films such as Alice in Wonderland and The Little Mermaid. He also did a great image of all the Disney dogs from Pluto to the Dalmatians to Lady and Tramp. I have this image on a sweatshirt, and had no idea it was a piece of Bill's until I was researching this article. These talented artists have a way of surprising us. As I mentioned, Disney pulls artists from both inside and outside the company to create this fun artwork. Will Gay is one of those internal artists, though he comes from an interesting place. Gay works for Disney's Yellow Shoes Creative Group, the in-house advertising agency for The Walt Disney Company. Will is creative director at this unit, tasked with graphics, video, ads, and promotional campaigns for all Disney destinations. Its subjects include Disney Parks, Adventures by Disney, the Disney Vacation Club, Disney Cruise Line, and Aulani. He has been allowed to moonlight and show his love for the mouse by producing artwork for the company since his debut at the Festival of the Masters in 2009. 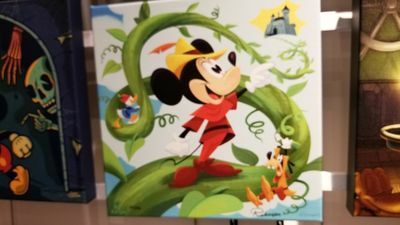 As per his bio, "he has continued to interpret his favorite iconic characters, like Mickey Mouse, and others in new and intriguing ways in his signature style. Will is influenced by a combination of pop culture, street art, graphic design and skateboarding." That combination of styles is evident in his latest series, which depicts Mickey and Friends (mostly canine pal, Pluto) in what I'd call comic book style. They're together on classic attractions, such as Big Thunder Mountain Railroad, and sailing over Spaceship Earth in a balloon. What's particularly special about this series is that the prints are not on canvas, but on birchwood. 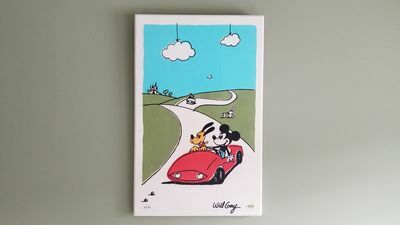 I purchased one of these pieces, entitled Autopals, that depicts Mickey and Pluto happily driving down the road with a familiar castle in the background—they maybe had a fun day at the Magic Kingdom. I bought a piece of Will Gay artwork on a recent Walt Disney World vacation. Photo by Gregg Jacobs. It was created in a limited edition of 95, unframed as per the artist and on birchwood. It was priced at $149.95, although I took big advantage of my 20 percent off passholder discount. You can view or buy Disney artwork at locations all over property, at both Walt Disney Word or Disneyland, but they are centered at the Art of Disney locations. In Orlando, they are located on Main Street USA at the Magic Kingdom, to the right of Epcot's Spaceship Earth as you enter the park and and Disney Springs Marketplace across from Disney Days of Christmas. At Disneyland, visit The Disney Gallery, located on Main Street USA. 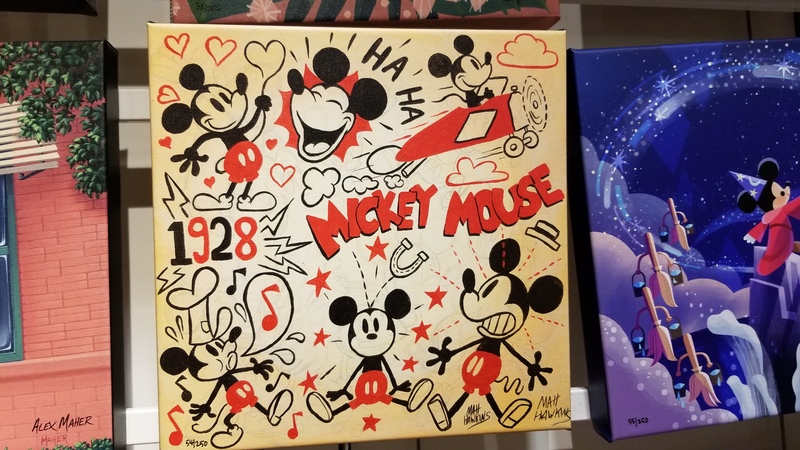 The Wonderground Galleries, located at the Disney Springs Marketplace Co-Op and the Downtown Disney District at Walt Disney World and Disneyland, respectively, are also a great place to visit, particularly if you're interested in Celebration of the Mouse artwork. If you want to meet these artists in person to get your artwork signed or pick their brains about their experience as artists or with Disney, there are always opportunities to do so. Disney frequently holds "Artist's Showcases" where, usually at one of the Art of Disney locations. The particular artist will be available for a stated period of time to sign your latest collectible or chat. I've found all the artists to be very friendly and approachable, happy to talk about their experiences working for Disney. Disney has also become very fond of festivals. As I mentioned earlier, the Epcot International Festival of the Arts is currently in full swing and runs through February 25. It's a great chance to stroll around World Showcase and see some great artwork from a diverse group of talent. They feature both Disney-centered artwork and otherwise. The best part about the collections both here and at the shops, is that they're available in all price points. Disney typically takes the images and puts them on all kinds of merchandise. You can buy a $1.99 postcard or a $10,000 piece of original artwork or anything in between, from limited edition and mass prints, to T-shirts, tumblers, and throw pillows (I saw the Matt Hawkins work in the picture above on a pillow). One of my favorite souvenirs has been to buy a print for around $30 to put in a Mickey frame for around $20 for a unique piece of artwork for around $50. Whether to purchase or just to view and appreciate some great pieces of Disneyana, I encourage you to see what these talented artists have to offer.